We are very excited to announce our second annual “Jamaica-Rama!” celebration, which will take place from May through October. Visiting during this season means fewer people on the beaches, more time to get a taste of Jamaican culture, and some pretty incredible rates. Although some properties reduce the number of activities they offer their guests during this time, that’s not the case at Sunset at the Palms. This resort heartily embraces its mantra of creating “Sensory Magic” by encouraging guests to use all five senses to explore their island paradise. From sunset viewing parties to festive culinary affairs and special movie nights, there’s much to see and do during Jamaica-Rama! For a lot of visitors, a trip to Jamaica is about culinary exploration. The resort’s open-air dining room, Palm Grove, hosts a lineup of themed events that change each evening, and guests can look forward to a bi-weekly rotating menu that includes Jamaica Nights on Mondays and Fridays and a Seafood Fiesta on Saturdays. Jamaica Nights pay homage to some of the foods visitors to Jamaica are most interested in sampling, from jerk chicken, to ackee and salt fish (Jamaica’s national dish), to a variety of crazy-looking but tasty fruits. The seafood buffet lets guests sample some of the finest products of the Caribbean Sea, including a whole grilled fish that’s always a highlight of the evening. Nestled among endless white-sand beaches and lush foliage, Sunset at the Palms invites guests to experience the sensuous warmth of their resort any season of the year. 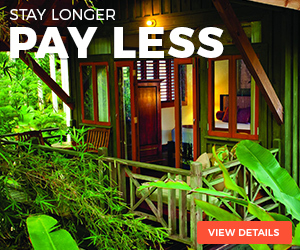 A stay here features air-conditioned accommodations in 85 treehouse-style guest rooms with private balconies; private beach access and a variety of non-motorized sports; tennis courts, a fitness center and swimming pool; all meals and beverages; and Club MoBay VIP arrival service at Sangster Airport in Montego Bay, for fast tracking through immigration and customs. During Jamaica-Rama!, resort rates start at $168 per person per night, with a three-night minimum stay required. Jamaica-Rama! runs from May through October.